Books are accepted to add to our circulating collection or to sell at our book sales. Used books must be in good or excellent condition and may not include textbooks. Donors may purchase books from the Library’s Amazon.com Wish List: Click to View The Library’s Wish List. Donors may participate in our Honor & Memorial Book Program. This program allows individuals or groups to purchase a book and dedicate it to a special someone. Click to View the Honor & Memorial Book Program Brochure. Monetary Donations are also gratefully accepted and help to sustain the library and all of its programs and services. To learn more about donation opportunities, you may contact the Library at (570) 646-0826 or stop by the Circulation Desk. 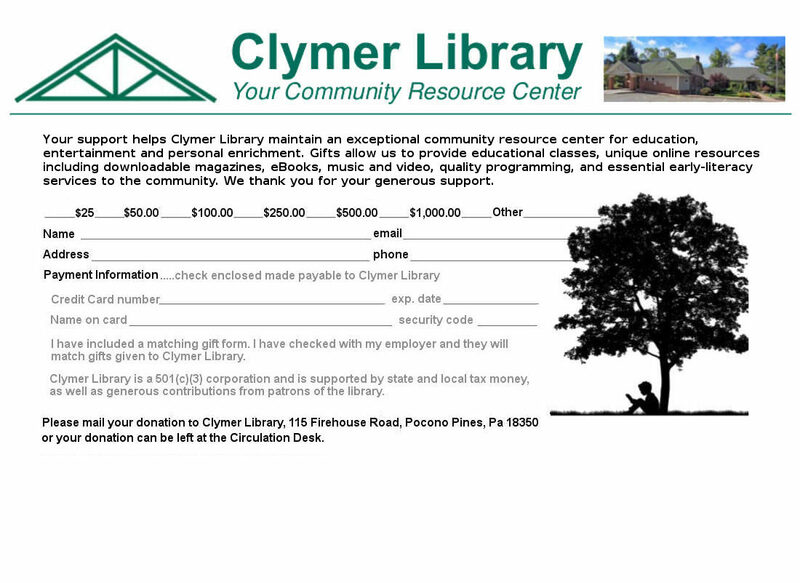 The Clymer Library Association is a 501(c)(3) non profit organization and acknowledges that no goods or services were provided to you in return for your contribution.